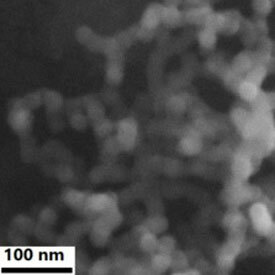 Super hydrophobic nano SiO2 is a new type of material with structure of dendritic nano silica. It is created by controlling the composition of nano SiO2 and surface microstructures. The surface of this super hydrophobic material has a new nano-micron composite structure.There are a large number of nano-micron level of the protrusions and grooves which make air fill with water and the material. The contact area between water and the material are greatly reduced, thus showing a strong hydrophobicity. When the contact angle is close to 180 degrees, the water droplets are close to spherical morphology and can roll easily on the super hydrophobic nano SiO2. If the material surface sticks some dirty things, such as dust, it will be taken away by rolling liquid showing the performance of “self-cleaning”. Therefore, super hydrophobic material is also known as “self-cleaning” material. When a material surface hydrophobic angle is greater than 150 degree, it is called “superhydrophobic material” or “self-cleaning material”. Super hydrophobic material is characterized by “self cleaning “ability. Water roll on its surface to form spherical droplets which can take away dirts on the surface. Self-cleaning material-nano glass is water repellent and has antifouling ability and aseptic effect. When the liquid on its surface to form spherical droplets, rolling can take away dirts on the surface, giving the material “self-cleaning” capacity. Super hydrophobic nano material can be widely used in waterproof clothing , super waterproof umbrella, car maintenance, solar panels, liquid non-destructive transmission, glass, ceramic, cement surface treatment. Through continuous improvement, we have developed a strong adhesive, wear resistant super-hydrophobic material, giving the material a wider range of potential applications. Moisture resistant- The material has a super-hydrophobic effect on water and some other liquids which can keep the objects dry. Anti corrosion – nano glass has super hydrophobic effect which can exclude ordinary water, salt water and water-soluble acid or alkali.It has good anti-corrosion effect. Anti icing – The surface coated with the super hydrophobic material can be kept completely dry to prevent freezing, frosting or the frozen objects on the surface can be easily removed. Anti fouling – Water or other liquids that are prone to breed bacteria can not penetrate super hydrophobic materials, and dust or dirt on the surface is particularly susceptible to being taken away by liquid.